It may look like an ordinary USB memory stick, but a little gadget that can sequence DNA while plugged into your laptop could have far-reaching effects on medicine and genetic research. The UK firm Oxford Nanopore built the device, called MinION, and claims it can sequence simple genomes – like those of some viruses and bacteria – in a matter of seconds. More complex genomes would take longer, but MinION could also be useful for obtaining quick results in sequencing DNA from cells in a biopsy to look for cancer, for example, or to determine the genetic identity of bone fragments at an archaeological dig. The company demonstrated today at the Advances in Genome Biology and Technology (AGBT) conference in Marco Island, Florida, that MinION has sequenced a simple virus called Phi X, which contains 5000 genetic base pairs. This is merely a proof of principle – "Phi X was the first DNA genome to be sequenced ever," says Nick Loman, a bioinformatician at the Pallen research group at the University of Birmingham, UK, and author of the blog Pathogens: Genes and Genomes. But it shows for the first time that this technology works, he says. "If you can sequence this genome you should be able to sequence larger genomes." 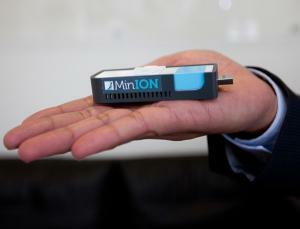 Oxford Nanopore is also building a larger device, GridION, for lab use. Both GridION and MinION operate using the same technology: DNA is added to a solution containing enzymes that bind to the end of each strand. When a current is applied across the solution these enzymes and DNA are drawn to hundreds of wells in a membrane at the bottom of the solution, each just 10 micrometres in diameter. Within each well is a modified version of the protein alpha hemolysin (AHL), which has a hollow tube just 10 nanometres wide at its core. As the DNA is drawn to the pore the enzyme attaches itself to the AHL and begins to unzip the DNA, threading one strand of the double helix through the pore. The unique electrical characteristics of each base disrupt the current flowing through each pore, enough to determine which of the four bases is passing through it. Each disruption is read by the device, like a tickertape reader. This approach has two key advantages over other sequencing techniques: first, the DNA does not need to be amplified - a time-consuming process that replicates the DNA in a sample to make it abundant enough to make a reliable measurement. Second, the devices can sequence DNA strands as long as 10,000 bases continuously, whereas most other techniques require the DNA to be sheared into smaller fragments of at most a few hundred bases. This means that once they have been read they have to be painstakingly reassembled by software like pieces of a jigsaw. "We just read the entire thing in one go," as with Phi X, says Clive Brown, Oxford Nanopore's chief technology officer. But Oxford Nanopore will face stiff competition. Jonathan Rothberg, a scientist and entrepreneur who founded rival firm 454 Life Sciences, also announced at the AGBT conference that his start-up company, Ion Torrent, will be launching a desktop sequencing machine. Dubbed the Ion Proton, it identifies bases by using transistors to detect hydrogen ions as they are given off during the polymerisation of DNA. This device will be capable of sequencing a human genome in 2 hours for around $1000, Rothberg claims. Nanopores are an "elegant" technology, he says, but Ion Torrent already has a foot in the door. "As we saw last summer with the E. coli outbreak in Germany, people are already now using it," he says. By contrast, the MinION would take about 6 hours to complete a human genome, Brown claims, though the company plans to market the device for use in shorter sequencing tasks like identifying pathogens, or screening for genetic mutations that can increase risk of certain diseases. Each unit is expected to cost $900 when it goes on sale later this year. "The biggest strength of nanopore sequencing is that it generates very long reads, which has been a limitation for most other technologies," says Loman. If the costs, quality, ease of use and throughput can be brought in line with other instruments, it will be a "killer technology" for sequencing, he says. As for clinical applications, David Rasko at the Institute for Genome Sciences at the University of Maryland in Baltimore, says the MinION could have huge benefits. "It may have serious implications for public health and it could really change the way we do medicine," he says. "You can see every physician walking around the hospital with a pocketful of these things." And it will likely increase the number of scientists generating sequencing data by making the technology cheaper and more accessible, he says. The rush to make computers smaller and smaller has been going on for some time now, but we may have a winner–at least for now–in terms of the small computer race. It’s called the Cotton Candy from FXI Tech, and though it just looks like your standard USB thumb drive, it turns out it’s packing an entire very small computer in its tiny packaging. The specs, admittedly, aren’t anything truly spectacular, offering up a dual-core ARM Cortex A9 on the processor end, backed up by an ARM Mali-400MP GPU, wi-fi and Bluetooth connectivity, a USB plug and a microSD card slot as well as its own Android operating system. But when you consider that it’s all encased in a device that’s the size of a basic key chain, well, suddenly the whole picture looks a lot more interesting. What this is designed to do is hook into much larger displays, thanks to that HDMI plug, and allow you to perform many of your basic computer functions. You’ve got Bluetooth for the peripherals, microSD for the storage, cloud access from the Android app…it’s a very simple, very basic, but extremely portable setup. And, you can even hook it into another computer with the USB plug included, which in turn will let you borrow the peripherals hooked into that computer (great if you needed to print something, I’d say) to do the various jobs you want done. And if you want an ultra-small computer to take with you most anywhere you go, Cotton Candy should be on hand in time for Christmas 2012, and the pricing is expected to land at the $200 mark, which isn’t half bad. Though it does make me wonder why most wouldn’t just buy a full on laptop for not too much more, especially if they buy used. Still though, an ultra-small PC for an ultra-small price tag is in the offing, so what do you guys think? Will the Cotton Candy catch on? Or will we be seeing these go for half that or less just to clear them out? No matter what you think, we love hearing from you, so head on down to the comments section and tell us what you think!